Stockland has celebrated the success of Australia’s largest single rooftop solar system at Stockland Shellharbour, with NSW Minister for Industry, Resources and Energy, Hon. Anthony Roberts MP, and NSW Environment Minister, Hon. Mark Speakman MP, visiting the centre for a rooftop tour. The Stockland Shellharbour solar system, switched on in May this year, has already generated over 400,000kWh of energy for the centre, with the system on track to meet its target of 1.74 million kWh per year. Marking Stockland’s focus on sustainability, the company today announced it is planning a further three additional solar panel projects at shopping centres in Western Sydney and Western Australia. Stockland invested more than $2 million in the solar Photo-Voltaic (PV) installation at Shellharbour which also generated more than 50 jobs during the six months of construction, with close to half of the contractors from the local Illawarra area. The system comprises 3,991 PV panels installed on the roof across a total surface area of 7,658 square metres – similar in size to a football field. On average, the system generates 4,789 kilowatt hours (kWh) per day – enough to power 280 homes and 28 per cent of the centre’s daily base building power requirements. NSW Minister for Industry, Resources and Energy, Hon. Anthony Roberts MP, said Stockland’s solar panel system highlighted business confidence to invest in renewable energy across the State. “I am proud to see the nation’s largest solar panel system right here in New South Wales, generating cleaner, greener energy, local jobs for the region and cost savings for business owners,” Mr Roberts said. NSW Environment Minister, Hon. Mark Speakman MP, also congratulated Stockland for its commitment to using renewable energy which will deliver both environmental and financial benefits. 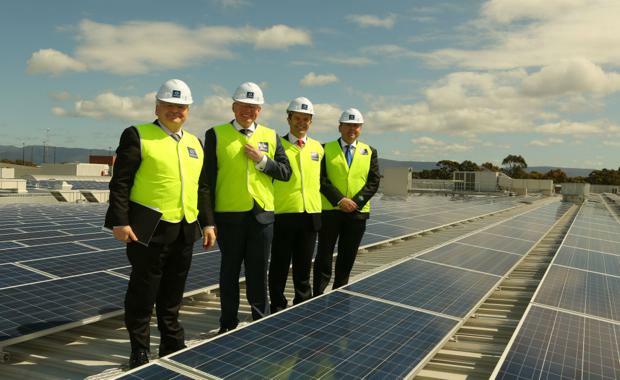 “I am delighted to be here to see first-hand the size and scale of Stockland’s rooftop solar system. Construction of this commercial solar project is an important step for renewable energy in New South Wales, bringing with it environmental benefits, new jobs and a bright future for the renewable energy sector. This system is already generating enough energy to power 280 homes per day and will continue to offset around 1,700 tonnes of CO2 annually,” Mr Speakman said. The Stockland Shellharbour solar system is just one of a number of sustainability initiatives led by the diversified property company. Stockland issued the first Green Bond by an Australian corporation earlier this year which has assisted in funding the solar project. Stockland also has the largest number of Green Star rated shopping centres in Australia and yesterday released its 2015 Annual Review, highlighting key sustainability targets for the coming year.